Kerry ended their goal drought in some style as Longford's much-anticipated trip to Killarney ended in a 4-11 to 1-11 All-Ireland SFC qualifier defeat. Eoin Brosnan netted three times and captain for the day Colm Cooper was also on target as man-of-the-match Kieran Donaghy tore the Longford defence apart. Three goals inside 16 minutes had Kerry well on the way to booking a quarter-final meeting with Armagh next weekend. The hosts led 3-07 to 0-07 at the break. Brian Kavanagh, who scored 1-06, and Longford skipper Damien Sheridan, who saved a Mike Frank Russell penalty, kept the underdogs in touch but Brosnan's third strike really brought the contest to a premature end. A delay of 15 minutes - caused by traffic congestion around the ground - did little to put Kerry off their rhythm as they ripped into the midlanders in front of just over 18,000 spectators. Jack O'Connor's men, so disappointing during the Munster championship, had obviously wiped the slate clean and it showed in a sparkling opening. 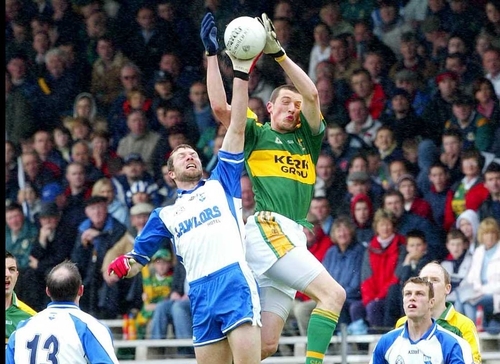 With the 6ft 5in Donaghy in at full-forward, Kerry had a target man who always had the upper hand on his markers. The Tralee youngster's aerial ability, honed during a successful basketball career, was there for all to see. Donaghy teed up Russell for the game's opening point and his seventh-minute flick-on allowed Brosnan the time and space to net for a 1-01 to no score lead. Unusually it was Kerry's first goal of the championship, five games in, and while Longford had only just hit the post themselves at the other end through David Barden, it looked ominous for Luke Dempsey's side. Three points from play from Paul Barden, David's brother, showed that Longford, who stayed overnight in the Adare Manor hotel in Limerick, had not just come down to make up the numbers. They were rocked however by two goals in the space of five minutes - Donaghy fielded an Aidan O'Mahony ball in and picked out Brosnan for a coolly taken strike, and a Donaghy interception and neat pass from Russell saw Cooper nip in and palm home at the far post in the 16th-minute. 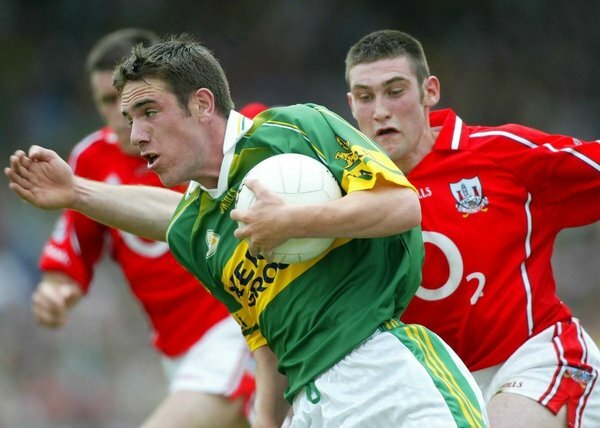 At 3-02 to 0-03 in front, Kerry were cantering and Dempsey reacted by taking Donaghy's marker Barry Gilleran off and switching Diarmuid Masterson onto the big man. Having opted to play against the wind, Longford's decision looked a poor one but Kavanagh kicked two points to help his side get back into it. Still, Kerry hit another gear for the half's closing stages with Russell, Tommy Griffin, Cooper (free) and Paul Galvin all kicking points to put them nine ahead for the interval. Paul Barden missed a gilt-edged goal chance at the start of the second half, but points from Kavanagh (free) and Bernard McElvaney showed Longford's hunger. Midfielder McElvaney had been fortunate to stay on the field nearing the end of the first half as he was seen to retaliate and strike Donaghy in the face. Referee Vincent Neary ruled it just a yellow card offence. Cooper stretched Kerry's lead back to nine points with two classy scores, and although Padraig Berry played Kavanagh in for a lovely drilled goal finish on 50 minutes, Longford were left cursing seven wides during the opening 20 minutes of the second half. A foul on Donaghy by Masterson gave Kerry a penalty opportunity, but Russell's 52nd-minute shot was straight at Longford 'keeper Sheridan, who got his body well behind it. However Brosnan nabbed his hat-trick just minutes later when Cooper, with a fisted pass, played him in. There was no way back for Longford as their brave run in the qualifies ended with a late brace from Kavanagh being cancelled out by a point apiece from Kerry substitutes Bryan Sheehan and Sean O'Sullivan. Kerry: D Murphy; M Ó Sé, M McCarthy, T O'Sullivan; T Ó Sé, S Moynihan, A O'Mahony; D Ó Sé (0-01), T Griffin (0-01); Darren O'Sullivan, E Brosnan (3-00), P Galvin (0-01); C Cooper (capt) (1-03 (1f)), K Donaghy (0-01), MF Russell (0-02 (1f)). Subs used: Declan O'Sullivan for Darren O'Sullivan (34 mins), M Lyons for T O Se, B Sheehan (0-01 (1f)) for Griffin (both 56), S O'Sullivan (0-01) for Galvin, E Fitzmaurice for Moynihan (both 63). Longford: D Sheridan (capt); D Brady, B Gilleran, C Conefrey; S Mulligan, D Masterson, D Reilly; B McElvaney (0-02 (2f)), L Keenan; T Smullen, P Barden (0-03), P Berry; D Barden, P Dowd, B Kavanagh (1-06 (3f)). Subs used: A O'Connor for Gilleran (14 mins), J Martin for Smullen (58), K Smith for Berry (64).